The Project Settings page is divided into 3 sections: Project Details, Access to Project and Advanced Settings. In this section, you can edit the name of the localization project and its description (in Markdown format) - which will appear in the invitation emails sent to contributors and on the join page for public projects. The Default Reference Language is displayed instead of the project terms. Using this feature is recommended when the localization files you work with contain labels (keys/string IDs). 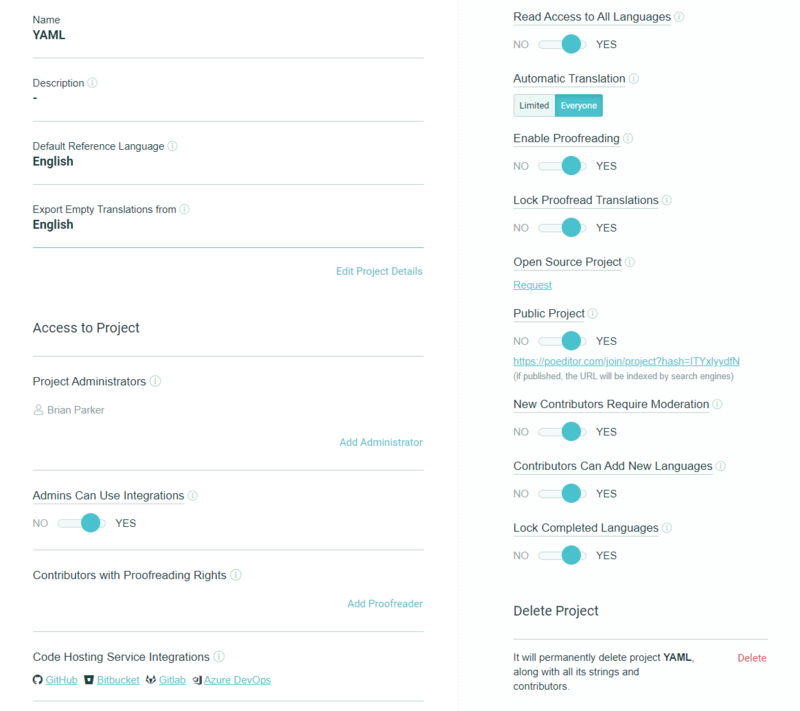 The Export Empty Translations from option allows you to fill in the empty translation fields of the localization file you are exporting with translations from another language in the localization project. Here, project owners can add/remove administrators and proofreaders to/from the project. Admins can also add or remove proofreaders. The Code hosting service integration section provides links to the GitHub, Bitbucket, GitLab, VSTS integration pages. If you are the project owner, you also have a Request Project Transfer link in this section. You can use it to move the project to the account of another POEditor user. Read Access to All Languages gives contributors the possibility to use any of the available languages with the Set Reference Language option. The reference language set by a contributor overrides the Default Reference Language set by an owner or by an admin. In Advanced Settings, you can also control the access to the Automatic Translation feature. Setting it to Limited allows only owners and administrators to use it, while setting it to Everyone also grants access to contributors. The Enable Proofreading option allows owners, administrators and other contributors with proofreading rights to exercise their proofreader roles. Once proofreading is enabled, a button will appear on the settings page, making it possible for owners and admins to assign new proofreaders to the project from the current list of contributors. Proofreaders can only check the translations of the languages they are assigned to as contributors. If the contributor is removed from the contributor list, he will also lose his proofreader role in the localization project. In Project Settings, you can also file a request for free localization for your Open Source Project. Setting Public Project to YES lets translators join the project by themselves, accessing the public join page in the generated link. A few specific features appear in Advanced Settings when a project is public: New Contributors Require Moderation, Contributors Can Add New Languages and Lock Completed Languages. The Contributors Can Add New Languages option allows users to add languages to a public project in the Join page, when they become a contributor. Lock Completed Languages hides 100% translated languages from the public project's Join page.